I thought at the beginning of the season that I wouldn’t say this, but this game will most likely be for 1st place in the Big Ten conference. Maryland hasn’t played the best lacrosse, but has been able to pull out wins. They have to step up their game against Ohio State. Charlie Raffa’s status is still uncertain, but looks like he won’t play due to an arm injury suffered against Penn State. Can Christopher May capitalize and can Jesse King lead an Ohio State offense to an upset? Pick: Maryland. Right now, Virginia won’t be playing in the ACC Tournament after going winless in conference play. Now it’s just making sure they get into the NCAA Tournament as an at-large team, which they should be able to do. Georgetown is also trying to make the tournament, and a win against the Wahoos would look great on their résumé. But I think Matt Barrett will be stellar yet again in cage. Pick: Virginia. The Brown offense has been one of the biggest stories in this lacrosse season. But with all the hype, they’re 9-3 and 2-2 in Ivy play, and could miss their own tournament. With a loss, the bears would fall to 5th since Penn has a tiebreaker over the Bears thanks to an 14-11 win a few weeks ago. The Big Red haven’t lost since a 10-9 shocking loss to Harvard. They can’t afford to lose again in order to keep pace with Princeton and Yale, which is right behind them. Pick: Cornell. It’s a battle of undefeated teams in the NEC at 4-0 in conference play. The winner will most likely host the NEC tournament in two weeks. After a slow start, St. Joe’s has won six straight, most of them by a comfortable margin. Hobart won 4 straight, 3 of those 4 by a score of 7-6, before getting embarrassed in the Carrier Dome by Syracuse. Pick: St. Joe’s. Marquette has alternated between wins and losses since a 14-6 win over Mercer in early March. A killer loss to Bellarmine might have hurt their chances of getting an at-large bid. A win against Duke could help soften that blow. But Duke doesn’t want to give the Golden Eagles a chance. This will be their prep before the ACC Tournament next week between the winner of UNC and Notre Dame. Pick: Duke. Maryland and Ohio State are playing for tops in the conference. 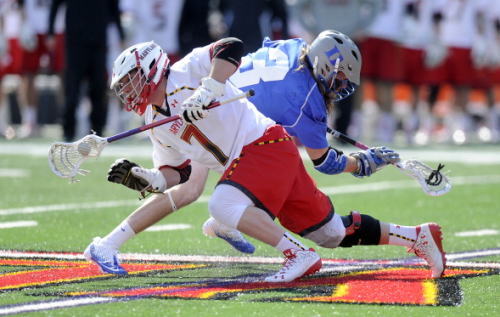 Michigan and Johns Hopkins will be playing for 3rd in the Big Ten. Hopkins is 5-6 and would need a win to at least be eligible for an at-large bid (teams have to be over .500 for an at-large bid). But I don’t think that will be enough. A loss to the Wolverines would definitely end their season earlier than expected for a preseason top 5 team. But a win would put the Jays at 6-6 into a crucial battle with Maryland next week. Pick: Johns Hopkins. It’s the game of the week, it’s #1 against #2. This time, Notre Dame is #1 and is looking for the top seed in the ACC Tournament. Two explosive offenses, two great coaching staffs, two great traditions, yadda yadda yadda. If you’re near a TV or computer or something you can view the game on, this is what you have to watch. It’s a tossup to pick a winner, although Notre Dame has home-field advantage. Pick: Notre Dame. Yale gets to face an explosive offense for the second consecutive week. They took care of Ivy rival Brown 16-10 last week, and have to face Lyle Thompson this time around. Thompson just broke Rob Pannell’s old NCAA career points record Tuesday against Binghamton. And I don’t think he’s ready to stop just yet. Lyle’s also a different animal than Dylan Molloy and the entire Brown offense. Pick: Albany. Maryland and Ohio State are playing for tops in the conference. Michigan and Johns Hopkins are playing for 3rd place in the conference. Penn State and Rutgers are playing for who’s in the basement of the conference. They’ve played great games against other Big Ten teams, and Penn State had promise early in the season, with an upset win against Penn in late February. But pair both teams again, and it would most likely be a different story. Penn State needs a win, but so does Rutgers. If Michigan loses and Penn State wins, both teams would be playing for 4th place next week at Michigan. Pick: Penn State.